The Strike Eagle was developed when the Air Force realized that it didn't have a fast medium attack aircraft. Proposals went out and it was decided to use a modification of the two seat F-15 to perform this mission. A major benefit was that the basic airframe/engine combination was already proven. All that was needed was to incorporate weapons systems and hardware. For this task, one of the prototypes, 71-0291, which had been used for a number of other projects, was chosen to be modified into the F-15E prototype. This aircraft had previously been fitted with fast-pac fuselage mounted fuel cells and had several other airframe and system updates incorporated. It was only left to attach the fuselage pylon. Unlike the production F-15E, there was only a single pylon in the fast-pac area. Current F-15Es have several smaller pylons in this spot, whereas the prototype had one large one on which MERs could be attached. There was also one on the fuselage centerline and one at the normal wing stations. 291 adopted a one-off 'charcoal lizard' camouflage scheme similar to what was carried by the A-10. This consists of FS 36118, 34092 and 34102 in a wrap-around scheme. This scheme was also tried out on some F-16s during a short evaluation period, but it was decided not to use it. Instead, Strike Eagles are painted FS 36118 overall. Ben is one of a myriad of Japanese companies that seems to come and go at will. Their sole claim to fame is that they have reboxed Tamiya 1/100 kits. In the interim, they have produced a few kits of their own, though I suspect it is more of a modification of some other models. 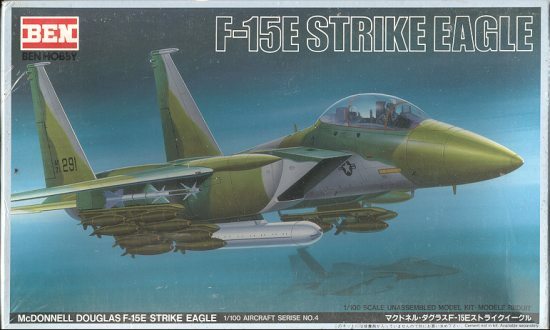 The only 1/100 F-15 previously done was boxed by Entex, though its origin is steeped in mystery. However, the Entex kit was the prototype Eagle and a single seat plane so this may be an all new mold. 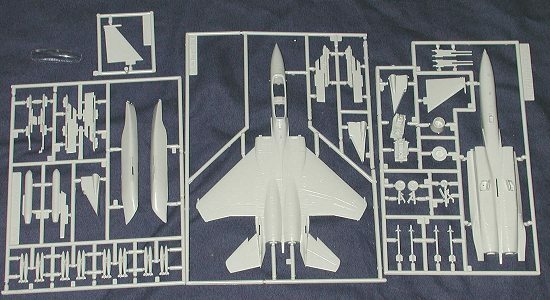 Before going into any detail, I should point out that if one decides to build this kit as a 'normal' F-15B, that can be done by leaving off the fast-pacs and pylons. There are regular Eagle wing pylons included. The airframe itself is really very well done. Spit top and bottom, each half is very well detailed with engraved panel lines. An interesting feature is that the main gear doors are integrally molded with the lower half and in the open position. Cockpits consist of a one-piece molding of a floor and seat. The canopy is a single piece. Ordnance consists of fair representations of Mk 82 slick bombs and a GE gatling gun for the centerline. This gun never got beyond the prototype stage. Pylon mounts are large and the pylons themselves are fair, but not really that well detailed. Same for the afterburner nozzles and the Sidewinder missiles. Instructions are straight-forward and should produce no problems. Color info is given as needed and is in Tamiya paints. This means the usual mixing if needed. No FS numbers are given. The small decal sheet is well printed, but mine was heavily yellowed. It can undoubtedly be bleached out if need be. Overall, it seems like a very nice and easy to build kit. For 1/100 enthusiasts, this has to be the only one around. Though many will say 1/100 is a dead end, there are quite a few kits out there, with this one being one of the better versions.